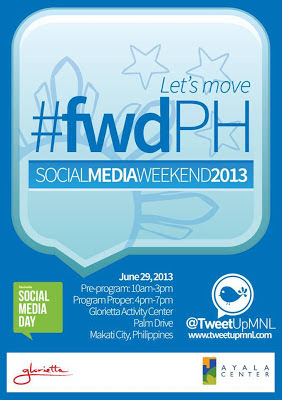 Join in the Social Media Weekend 2013 to be held this Saturday, June 29, at the Glorietta Activity Center, Makati City. Take this opportunity to meet other people active in social media and make things happen. Let us use social media to be heard and push forward changes for the common good of all. 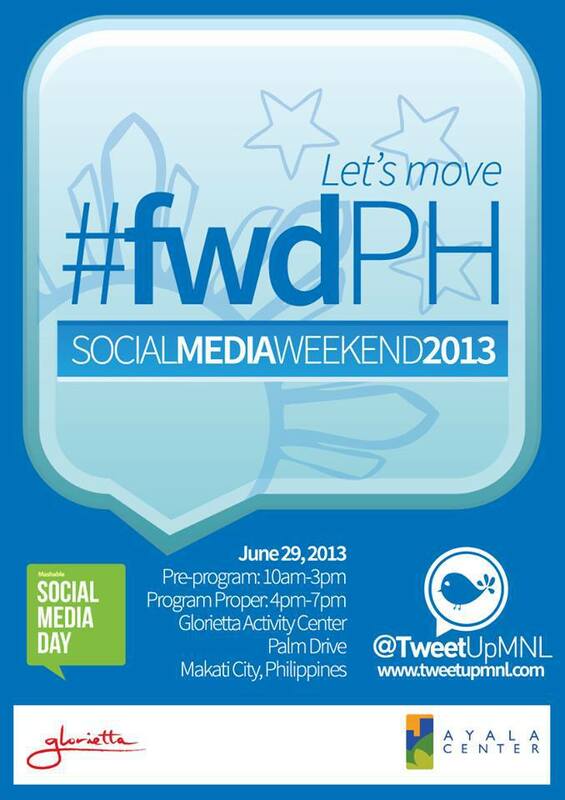 This year's event theme to celebrate the digital revolution happening around the world is "Let's move #fwdPH" . “Let’s move #fwdPH” is about being responsible and taking a stand on issues that affect us all. By joining voices, we can make politics work for the Philippines. Social Media makes it possible for us to achieve positive changes in the society. #SocialMediaWeekend events will continue on June 30 with simultaneous meet-ups in Quezon City, Baguio, Dagupan, Iloilo, Cebu, Cagayan de Oro, General Santos, Bukidnon and Davao. Social Media Day 2013 is made possible by AyalaMalls in partnership with Muni.com.ph, InstaPRINT, Black Pencil Project, Globe Telecom and Tweet Up Manila. Be part of the Social Media Weekend 2013! ADMISSION IS FREE!